When the body fails to replenish the water lost each day in urine, sweat, and feces, dehydration occurs. Although dehydration can result from inadequate intake of water, it is more commonly caused by abnormal water loss from the body, as in diarrhea or vomiting. Dehydration is a serious, even dangerous, condition that requires a physician’s immediate attention. If your child has been too ill to drink or has episodes of vomiting or diarrhea, be on the lookout, for signs of dehydration. If the child is mildly dehydrated, the only sign may be increased thirst. As dehydration progresses from moderate to severe, however, the number of symptoms will increase and become more severe. Common childhood illnesses like diarrhea and vomiting can cause your child’s fluid supply to drop to abnormally low levels. Infants and young children are particularly susceptible to dehydration because they expel large amounts of water in the production of urine. Indeed, infants need to replenish nearly a quarter percent of their total body fluids each day, while adults must replace less than ten percent. Always seek medical advice. 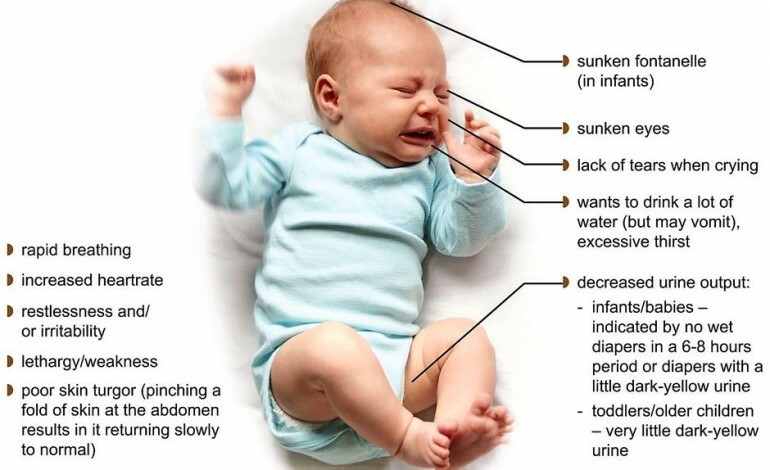 The doctor may want to examine your child to determine the cause of the symptoms and to evaluate the degree of dehydration. Dehydration can seriously threaten a child’s health by placing undue stress on the kidneys and heart as they try to compensate for the fluid depletion. Prolonged and severe dehydration can lead to shock and even death. The best treatment, of course, is prevention. Even if your child has no appetite when ill, encourage the intake of fluids. In cases of ongoing diarrhea, the doctor may prescribe an electrolyte-containing fluid, such as Pedialyte, or a similar preparation for the child to drink. (Electrolytes are the salts that make up an essential component of body water). Most cases of dehydration can be treated at home with fluid supplementation. If the child is vomiting, too ill to drink, or unable to take in sufficient quantities of fluid to counteract the losses, intravenous replacement may be required. This is known as parenteral fluid therapy and requires hospitalization. The nature of the child’s illness and the severeity of the dehydration will determine the course of parenteral therapy and the length of the hospital stay. What does COWS stand for in first aid?